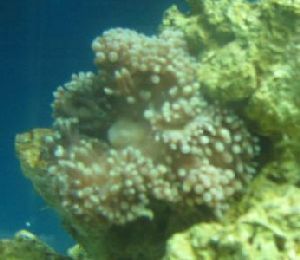 Bubble Tip Feeding vs. Condy Feeding - The Problem Child Hi WWM Crew, <<Hello Thuy. Marina this morning.>> I love your site. I literally spend hours reading through problems and advice to find the right mix of answers to solve my problem. I have a 20G, with LR/LS, 1 yellow tail damsel, who gets along fine with my 'Nemo' Ocellaris, which I acquired from a friend that wanted a gold maroon he saw at an LFS that responded to nearly any anemone it encountered. It was pretty cool. (I wanted a blue tang instead of the damsel but I know it gets big and my tank is way too small for it). I also have A bicolor blenny that hides a lot, but is cute when he comes out; a cleaner shrimp; tiny hermit crab with plenty of empty shells, some snails, and a colony of button polyps. <<Sounds like a nice mix you have there.>> Anyways, I just recently acquired a BTA and a small Condy from an LFS that had to move out of the building. (these will be my last tank mates for this tank, I hope to take over a 55 Gallon soon =D to upgrade). <<I sure do hope so, too. 20 gallons is too little territory for the two anemones together. The Condylactis, ok, but the BTA.. questionable.>> The Condy is so simple to feed, because it sits upright and eats anything I drop on its tentacles, and food seems to stick to it better. <<Slightly stronger nematocysts. Plus, some animals are like weeds, it seems that the stuff you don't REALLY want is the stuff that does the best in a given environment. Take Aiptasia for instance.. or don't. ;-)>> But the Bubble is so much harder, since it likes to sit sideways on my rock.